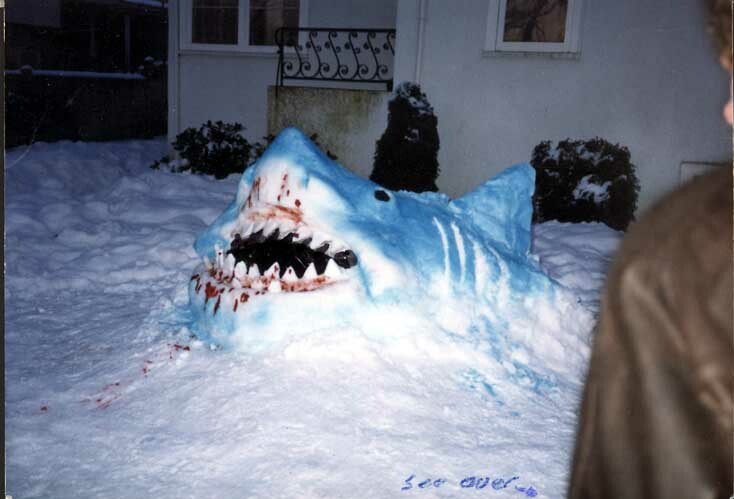 I know these people had little to no money to make "Snow Shark Ancient Snow Beast" but this is just inexcusable. Yes, they have the word snow twice in the title which I believe is a first and it also involves a shark that can swim around in the snow and attack people. Here's the trailer! Looks like something you'd find on disk 15 of a Mill Creek 50 pack. I'm guessing it doesn't occur to anyone to climb a tree? That still shot - I swear I owned a rubber shark just like that at one point! If they did that, the Tree Shark (the ancient tree beast) would get them. Snow Shark Ancient Snow Beast! With the ability of flatten its body to the three inches of height for the snow hiding prey! I always find stuff like this in randomly shelved 4-packs at BestBuy, usually sandwiched between two Polonias and a fourth theme-related "movie". This has to be the silliest movie concept I've ever seen, and I love it! I cannot look at this thread, or that picture, without laughing like a giddy school boy. Is that a shot from the sequel? Looks like they really improved on the special effects. I thought about renting this today, but my wife wanted LIFE OF PI instead. I am crushed. I love the part in the trailer where the guy is talking about "Every town has it's secret." The whole time, I thought his arm was missing, and I figured "how fitting." Then I began asking myself, "how did THIS movie afford that visual effect?" Then I saw his arm! Oh man, this one has layers of enjoyment written all over it. You didn't lend it out to Batman, did you?